Saving is easier said than done. One of the biggest challenges in personal finance is working out ways to shrink the repeated bills that devour our monthly budgets. These incessant consistent expenses only fill up our budget, leaving us with less to save and invest for the future. We’re also left with less money to spend on things that we enjoy. 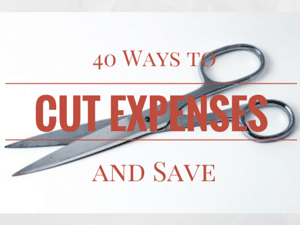 If you’re in the same boat and need help with ways to save, then Forty Ways To Cut Your Monthly Expenses by Trent Hamm at The Simple Dollar is worth taking a look at. According to Hamm, the best approach for cutting required spending is to assess all of the required expenses and find ways to lower that number. Hamm provides forty techniques to do exactly that, and divides them into several groups. Decrease your automobile expenses by carpooling. Reduce your debt by consolidating your student loans. Cut your energy bills by unplugging all of your unused electrical devices. Save on entertainment expenses by cancelling or downgrading your cable. Cook (and pack) your own meals at home to moderate your food bills. Downgrade your health insurance if you want to cut back in that department. Find ways to shrink your phone bill by switching to a cheaper network provider. These examples are all easy to implement. For even more creative ways to save, check out the full post here.